Three years ago, my husband José took our boxer, Pablo for his morning walk. Business as usual. Or so we thought. Twenty minutes later I got a call from José that he had fallen. I rushed to where he was and managed to get our doctor to get there. The next thing we knew he was taken to the hospital for a hip surgery. This was what I had been dreading since I moved to Mumbai- an emergency and no family around to help. But help came in the form of neighbours, acquaintances and even strangers. A potentially bad situation brought me a deep assurance that both of us would be fine no matter what. This experience and several others I’ve had since have made me realise, very deeply, that heartbreaks, disappointments and failures are part of the journey. I need to look behind them to see what blessings and lessons they bring to me. Here are just some of the lessons I’ve learned. Gratitude brings light to many a dark place – After my husband’s accident, I began to better appreciate the abundance that we enjoy. To a large extent, I credit his quick recovery to the attitude of gratitude we both fell into. Love can help you heal – Plugging into the Source of all Love (God) and getting more connected to the people who really value you, helps you to heal. But most of all you’ve got to learn to love yourself. Letting go brings abundance – Allowing life to take its course and not trying to control people and outcomes can bring a lot of abundance into your life. Life is all about choices – Being at peace is a choice. Leaving the drama behind brings peace. As does forgiveness, of course. I’m only responsible for my behaviour – How people react to me or to other people is really their call. I’m learning not to take up causes that are meaningless or attempt to change people. There are days that I forget these lessons and revert to my old way of thinking. But those days are less frequent now. The clouds that come my way do indeed add color to my life! These are lessons that we are aware of and try to follow. We keep slipping now and then, so we have to keep reading these lessons! Beautiful life lessons, Corrine! Sometimes unfortunate incidents end up teaching us the most valuable lessons! 🙂 Absolutely resonate with ‘There are days that I forget these lessons and revert to my old way of thinking. But those days are less frequent now.’ Peace. I’m glad your husband came out of the surgery and recovery period fine! I totally agree with your Life’s Lessons! Glad to hear that Jose has recovered, Corinne. 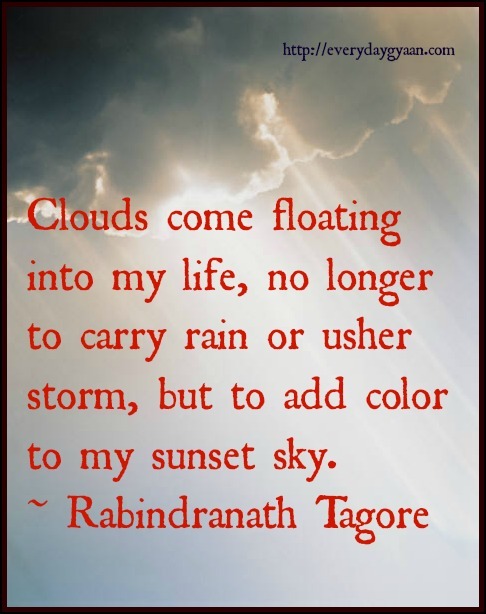 I too love the Tagore quote! Although we can’t see God, we can love each other, which is as good as loving God. That is a beautiful quote – I hadn’t heard it before, but I will remember it. Thank you! I think we all have issues remembering that we can’t control others, even though we would really like to. It is hard to stay in our place minding our own business, we always seem to know what is best for others, but never taking a good look at ourselves. We don’t usually like it when someone else gives unsolicited advise, but we have no problem giving it to them. Reminding ourselves to back away and disconnect from the outcome of others and then we can have peace for ourselves. Good reminder. There are many days when I’ve felt insecure and unsure watching the clouds in my life. I wont lie. They still exist and hover around me. But I make an additional effort these days to confront them and tell myself “this too shall pass”… “better days are ahead”. Glad your hubby is well now. That must’ve been pretty frightening. So true that when we let go abundance flows. Perhaps it’s because we see the blessings even in little things. Great post. It is, indeed, a sign of Christian maturity when one can see the blessings, though they be clouds, in even the most difficult of situations. Thanks, Corinne, for reminding us all that we can definitely choose our attitude toward any given situation and that God will see us through. //Letting go brings abundance// and //Life is about choices// these are two mantras that I also personally strive to live by all the time and have to completely agree with you that these small pieces of wisdom sure do bring a lot of peace and contentment in our lives. I’m glad your hubby healed well. Certain incidents really do cause us to reflect on who-or what–is important in our lives. Hopefully, we are aware. I’ve been actively working on “letting go brings abundance” and seeing some fruits. It gets challenging but I’m up for it! Again, that quote. Love it! Sweet! When we sit back and reflect, life is beautiful with all that it brings us…perfect and imperfect. Sorry to know about Jose’s fall. Hope he is now his usual self. It is during crisis that we learn much of LIFE. Gratitude, as you have mentioned is one aspect.Keep it up.Wish you and your family a very bright Diwali. Such great points, thanks for sharing! Clouds come into my life to add colour and vitality to my life . I am glad you brought the beauty out from this incident, Corinne. I hope your husband is doing well and sending in +ve vibes for a speedy recovery! Thanks, Ruchira. Yes, he’s fine now. This happened three years ago. Those are some valuable lessons…some I learn too, along the way. The best part is that we’re learning. And thank you, today marks three days since Jose came out of the hospital – and he’s fine!